Enjoy downloading the Free Super Sunday Flyer PSD Template created by Brandpacks! The Free Super Sunday Flyer PSD Template was designed to promote your next party and club event. This print ready flyer template includes a 300 dpi print ready CMYK file. All main elements are editable and customizable. You can edit the main text via text tool, the model image you can replace via smart object, right click edit smart object in your layer menu. The flyer is fully layered and organized to keep customization very simple! Fully Editable, you can modify everything very easy and quick. Changing the color style, pictures, Text. It is well organized in folders and layers. 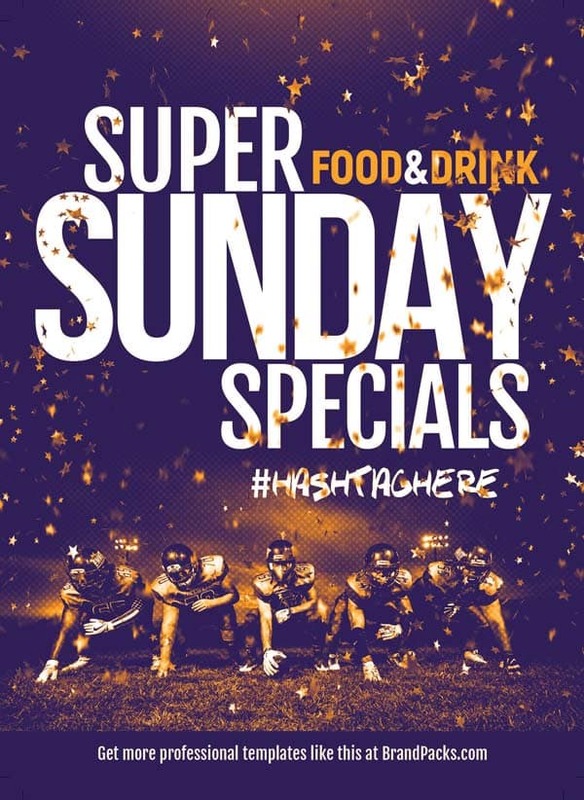 Check out and download the Free Super Sunday Flyer PSD Template for local sports bars! This template is all you need to create amazing designs for your next Football Match and Game Day Pub Event. Easily create NFL SuperBowl, local college football or great tailgate party flyer. The free American Football Flyer PSD Template is a classic NFL style, this football flyer design is as impressive as it is easy-to-use. The flyer template is perfect for sports bars and clubs to run football tournament related promotions all year long. Furthermore, thanks to the vector-based 5×7″ layout, the design is perfectly sized for flyers, table tents & posters. Download the Summer Jam Party Free Flyer Template! Download the Urban Music Party Free Flyer Template! Download 2133 free flyer templates for Photoshop! Best free PSD flyer templates of the web! Free Flyer and Poster Templates for personal and commercial use!